Now that the woodshed project is done, it might be time to fix my motorcycle. 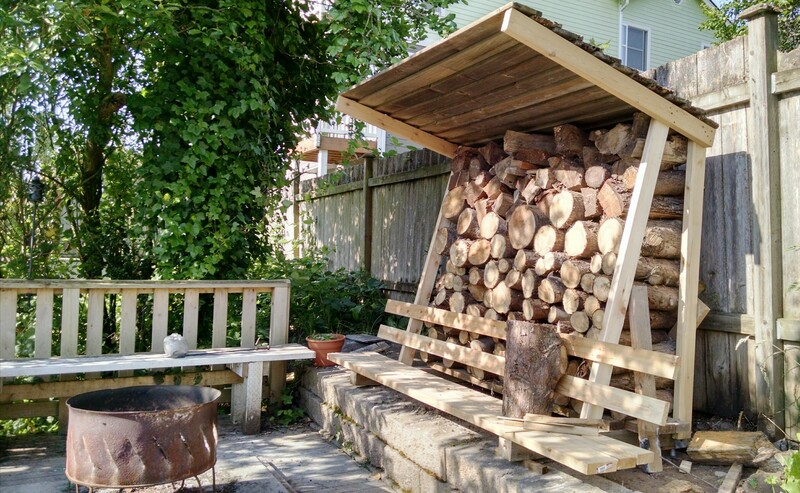 Adam H. came over yesterday and we constructed this shaded storage box for all the firewood that has been cluttering up my yard. Since it abuts the firepit area I thought it would be fun to build in a new bench for more cozy seating; now the fire is ringed on three sides. A short, clear, and approachable adventure into notions of infinity, using high-resolution monitors as the introductory analogy. We should organize an event called Naked Man where everyone runs around with their clothes on fire. I’ve been watching the spread of this “social justice warrior” meme with some bemusement, because it is clearly just another fantasy bogeyman for racist and/or sexist bigots – what kind of troglodyte thinks social justice is a bad thing, and how deeply enmeshed in entitlement fantasyland do you have to be in order to say so in public without embarrassment? – but the term “SJW” turns out to be very useful despite its lack of real-world referent, since it offers the “gamergate” assholes and their ilk a clear warning signal they seem happy to tattoo on their own foreheads. Nobody admits to being a racist or a sexist, but these folks don’t seem to have realized yet that ranting on about “SJWs” sends the same signal loud and clear. This sounds a lot like an idea I was toying with for the governance structure of an LLC which would manage a piece of land serving as a community gathering space. I was using a log function rather than a quadratic, but I didn’t go to this level of rigor, either. Neat to see someone actually work out a proof. Quadratic voting is a procedure that a group of people can use to jointly choose a collective good for themselves. Each person can buy votes for or against a proposal by paying into a fund the square of the number of votes that he or she buys. The money is then returned to voters on a per capita basis. Weyl and Lalley prove that the collective decision rapidly approximates efficiency as the number of voters increases.